The “Blog” of “Unnecessary” Quotation Marks: note "to dogs"
Jason notes that judging by the number of "accidents" on the porch, either the dogs are taking the quotes to mean "some pooping is OK" or, you know, Dogs can't read. Maybe he meant "dogs" to be interpreted as "homies"? I take it number one is OK, though? LOL! An advisory is a bulletin. 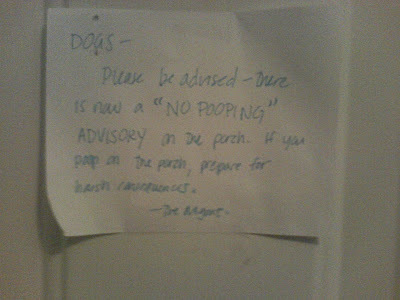 So, a "no pooping" bulletin is tacked onto the porch. Glad to hear it! (Didn't know they could.) I guess the dogs can continue to do their business though. I think this one also belongs on the passive-agressive notes blog. It's addressed to the dogs but "The Mgmt" is obviously yelling at the dog owners. What in the world kind of porch is this? I don't think I've ever seen dog poop on any porch... This completely cracks me up. that's just funny all around, but also, what a clever way to lay down the law without being overly authoritarian about it. you definitely don't want people getting rebellious when there's poop involved. An advisory? Seriously? What's next, an "anti-doodie memorandum"? the real back story is that the owner had a beagle that didn't like getting his feet wet, muddy or cold, so he resorted to #2ing on the porch, either in protest or to avoid the discomfort of the back yard. But, yes, he either can't read or took the quotation marks literally! he's either brilliant or ignorant! hahaha omg..so could humans poop on the porch? Are we expected to somehow relay this message to the largely illiterate dog masses?